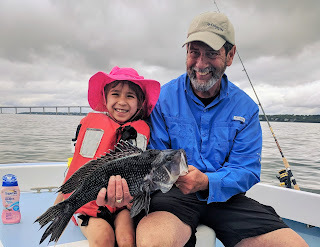 Lucia Wong (7) released black sea bass to 22” in mid-June last year fishing south of the Jamestown Bridge with Capt. Dave Monti. Proposed regulations will start the season on June 24 again this year. Stock status and proposed regulations for a variety of fish species were reviewed by the Department of Environmental Management (DEM) at a February 13 public workshop at the URI Bay Campus. Species discussed included Atlantic menhaden (pogies), summer flounder (fluke), black sea bass, scup, bluefish tautog, cod and blacknose shark possession limits. A public hearing on proposed regulations is scheduled to take place March 11, 6:00 p.m. at the URI Bay Campus, Narragansett; public input and DEM Marine Fisheries Division recommendations on regulations will then be presented to the RI Marine Fisheries Council for their recommendations on April 1; public input, Division and Council recommendations will then be presented to Janet Coit, DEM director for her final decision on 2019 regulations. Attending meetings gives anglers the opportunity to have their regulation thoughts considered as part of the process. Final regulations are expected to be set sometime in the first two weeks of April. Visit www.dem.ri.gov for the presentation that was reviewed at the meeting. Here are some highlights. Atlantic menhaden is not overfished and overfishing is not occurring. And last year only 722,388 pounds were landed against a quota of 2,366,618 pounds. Jason McNamee, chief of the marine affairs division of DEM said, “For some reason the menhaden did not come into the Bay last year so industry did not come close to landing the quota.” A few changes to the Atlantic menhaden management plan were recommended by DEM including one that would not allow any commercial menhaden harvest on Saturday, Sunday, official state holidays or prior to sunrise or following sunset. The fishery has experienced an expanded quota which may encourage more intense commercial fishing so the idea is to make sure all commercial harvesting is permitted not just purse seine nets as the management plan relates now. 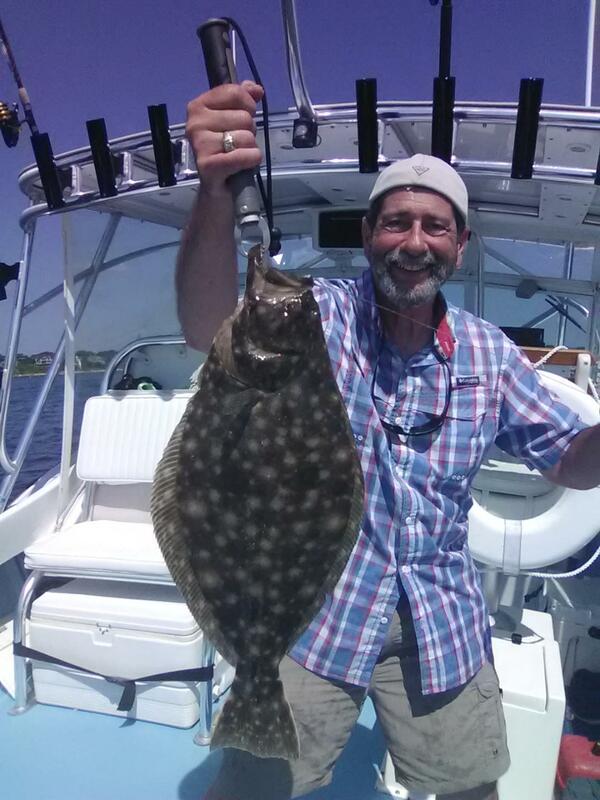 Summer flounder (fluke) is not overfished, however, overfishing is occurring relative to biological reference points. A new higher quota is likely to be set for the commercial fishery (perhaps 15% more) but not the recreational fishery as they slightly overfished their harvest limit in 2018. Recreational regulations will likely be status quo (the same as last year) with a minimum size of 19”, six fish/person/day with a season running from May 1 to December 31. Additionally, the RI Saltwater Anglers Association suggested a Special Shore Provision… a 16” fish, two fish/person/day from May 1 to December 31. If approved the program would run just in special provision locations identical to the provisional scup areas. Black sea bass are not overfished and overfishing is not occurring. A benchmark stock assessment was done in 2016 with no new information at this time. Status quo measures were approved by the Atlantic States Marine Fisheries Commission (ASMFC), the Commission regulates species that migrate along the northeast coast.. An update to the 2016 assessment is scheduled for 2019 but may not be available to use for the 2019 season. The status quo (same as last year) regulations the Division is recommending is a 15” minimum size with a three fish/person/day limit June 24 to August 31 and five fish /person/day from September 1 to December 31. Recreational anglers at the meeting asked for an earlier season start so shore and Bay fishermen have a chance to catch legal sized black sea bass in early June, however, as July and August roll around the Bay water warms and most of the legal sized back sea bass leave the upper and middle part of the Bay. Last year DEM postponed the start of the season to accommodate the RI Party & Charter Boat Association so their members could continue to fish throughout the fall and winter and they are recommending the same this year. Visit www.dem.ri.gov for scup, bluefish and cod regulation recommendations. Last week the Bureau of Ocean Energy Management (BOEM) held public comment meetings about the 84 turbine Vineyard Wind ocean wind farm project’s Environmental Impact Statement (EIS). Meetings took place in Nantucket, Martha’s Vineyard, New Bedford and Narragansett, RI. The EIS highlights potential environmental impacts of the project on habitat, fish, birds and mammals and plans to mitigation any negative impacts. Most fishermen making negative comments at the Friday night’s hearing in Narragansett, RI were those engaged in the $29.2-million mitigation negotiations with the developer through the Fishermen’s Advisory Board of the RI Coastal Resource Management Council. At the Narragansett meeting commercial fishermen attacked the project saying the wind farm array and the spacing between turbines is not safe. Turbines are now approximately one mile apart with much wider transit lanes through the middle of the project. Fishermen at the hearing said that in a storm the wind farm would be dangerous and hard to navigate. Their letter went on to state three key points. First, they would like to have rod and reel surveys done as part of the wind farm research protocol as this is how recreational fishing (and many commercial fishermen) fish. Rod and reel surveys conducted in all seasons when fish are present would give research a good idea of what fish are in the windfarm area before, during and after construction. Additionally, research methods to study impacts on pelagic fish such as sharks, tuna, mahi, etc. should also be done. Second, RISAA asked that additional structure be placed at the base of turbines to create habitat i.e. mussel growth, small fish and larger fish. With minimal effort pylons can create ideal rod and reel fishing habitat just like the Block Island Wind Farm turbines. The third point recommended a combined stakeholder advisory board to explore the impacts of not only individual projects but more importantly the cumulative impact of multiple projects, lease areas and developers. Presently such a fishermen/stakeholder panel with appropriate recreational participation does not exist. Visit BOEM’s website at www.boem.gov for hearing minutes once they are available. Large striped bass like this one caught by Mike Swain were not as prevalent last year. Striped bass are on the decline according to a new survey by Stripers Forever. Striped bass fishing is down. Striper fishermen, fishing guides and charter captains will tell you that for the past three to four years the amount of fish caught each year has been less and less. And, the fish have been getting smaller. 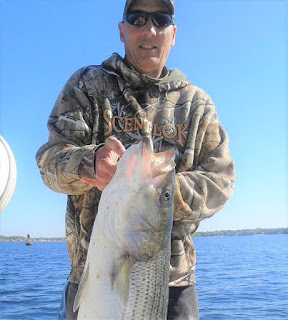 The results of Striper Forever’s 2018 annual survey on striped bass fishing was released February 9, 2019 and it was no surprise when it showed most anglers responding to the survey said their striped bass fishing was down. Out of the 450 survey responders, 72 percent said the number of striped bass they catch per hour has declined from 2017 to 2018, while 71 percent said the size of the striped bass they caught was ‘smaller’ or ‘much smaller’ than previous years. These survey results support angler claims of fish volume and sizes declining for the past couple of years. This was also the case when in 2018 the Massachusetts commercial striped bass fishery was unable to catch its full quota of large striped bass even after the state’s Division of Marine Fisheries added open days to the season in an effort to help meet the quota. A major striped bass stock reassessment of the wild Atlantic striped bass population has prompted the Atlantic States Marine Fisheries Commission (ASMFC) that manages striped bass, to admit that the spawning stock of large fish has shrunk sufficiently to require a warning that the stock is being overfished, and that overfishing is occurring. Stripers Forever blames the ASMFC management plan that focuses too much of the fishing effort on large, older fish that are vital to the breeding population. Over the last 10 years a reduced striped bass breeding population has resulted in highly variable production, including two good year classes, two average and six below average, including a record low spawn in 2016. The average striped bass year class sizes in Chesapeake Bay during the decade of the 1990s were roughly twice as large as those that have occurred in the last 15 years. A complete recap of all the survey information is available at this LINK on the Stripers Forever website. For more additional information e-mail stripers@stripersforever.org. Last week the New York State Legislature overwhelmingly passed a bill that would ban the harvesting of Atlantic menhaden, also called pogies or bunker, using purse seine nets up to three miles from shore. The bill restricts large-scale industrial boats from encircling schools of menhaden with nets that haul tons of fish for the production of fish oil and protein meal. Atlantic menhaden have been cited by many as an important forage fish for striped bass, bluefish, tuna as well as osprey and other fish and birds. They are harvested locally by fishermen who cast nests in Narragansett, Mt. Hope and Buzzard’s Bay to catch the fish for use as bait. However, the law New York passed does allow for large scale fishing at the State’s discretion to avoid fish kills due to depleted oxygen levels in estuaries. At deadline fishermen in Rhode Island are still at odds with Vineyard Wind, developer of the 84 turbine wind farm 14 miles off Massachusetts. The wind farm area is often fished by Rhode Island fishermen who initially had concerns about the spacing of the turbines. Fishermen wanted to make sure enough room was left between them for fishing and safe navigation. They are now planned for approximately one mile apart. Additionally, Vineyard Wind announced in December, 2018 its support for fishery transit lanes that are sited directly through the middle of the lease area. The aim is to accommodate fishermen based in Rhode Island, Massachusetts and Long Island area who need to transit the length of the wind areas to reach fishing grounds south and east of Cape Cod. Vineyard Wind has pledged to continue to work with fishermen to determine how best to utilize this flexibility, taking into account both fishing within the turbine area and transiting though the area. Commercial squid fishermen from Rhode Island are concerned about the wind farm changing the migration pattern of squid on rich fishing grounds in and around the wind farm. Recreational fishermen are also concerned about the impact the wind farm could have particularly during construction redirecting fish and bait/forage (like squid) and their migration patterns. In a research protocol recommendation to Vineyard Wind, Bay State Wind and Deepwater Wind/Orsted the Rhode Island Saltwater Anglers Association (RISAA) requested that a research protocol be developed for all wind farms that includes fish and habitat research before, during and after construction of wind farms that utilizes in part rod and reel surveys as well as research targeting impacts on pelagic species such as mahi, tuna and sharks. The recommendation related that RISAA supports renewable energy efforts like wind farms, however, they want to make sure that as utility scale wind farms are build i.e. the eighty-four turbine Vineyard Wind farm vs the five turbine piolet project off Block Island, that there are no adverse effects on habitat or fish. Vineyard Wind and the Fishermen’s Advisory Board hope to reach a mitigation agreement soon. 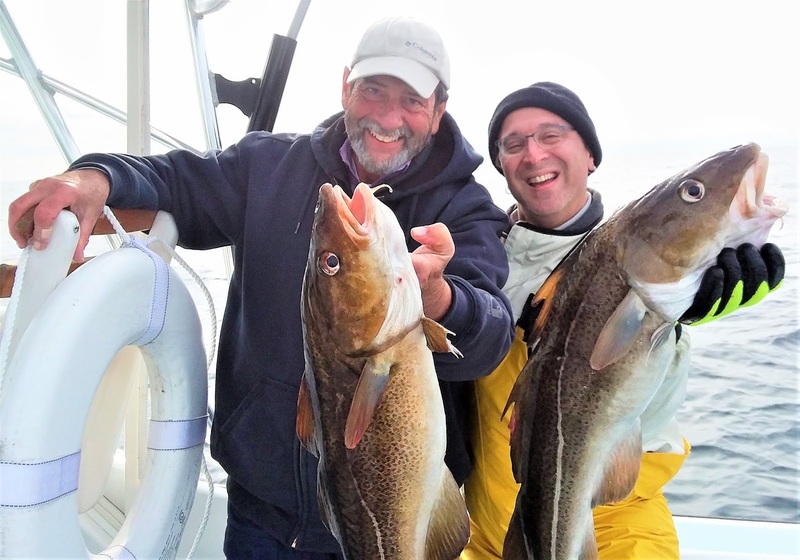 Cod and haddock fishing are just about the only saltwater fishing game in town this time of year. Capt. Dave Monti and angler Steve Brustein with cod caught off Block Island last year. Ice fishing is underway at northern New England ponds and lakes that have ice thick enough to support anglers. However, even with the frigid weather earlier this week at press time the ice has not been safe for fishing and skating in many areas. For example, as of yesterday, there were no Rhode Island authorities declaring safe ice in state owned lakes and ponds. The Mass Wildlife field office in Westborough, MA suggested contacting local police departments for safe ice conditions in your area. So before you put yourself, family and friends at risk check with local cities and towns to find out if ice on a local pond or lake is safe. Ice must have a uniform thickness of at least six inches before it is considered safe by the Rhode Island Department of Environmental Management (DEM). It generally takes at least five to seven consecutive days of temperatures in the low 20s. Safe ice is determined by a number of factors. First, you can't judge ice conditions by appearance or thickness alone; many other factors like water depth, size of waterbody, water chemistry, currents, snow cover, age of ice, and local weather conditions impact ice strength. Ice doesn't freeze uniformly. Continue to check ice conditions frequently as you venture out onto it. If a pet falls in: Do not attempt to rescue them, go find help. Well-meaning pet owners can easily become victims themselves. Remember to always keep pets leashed while walking on or near ice. Call local cities and towns for safe ice conditions in your area. The Rhode Island Division of Parks and Recreation provides information about Lincoln Woods State Park in Lincoln, Meshanticut State Park in Cranston, and Goddard Memorial State Park in Warwick on its 24-hour Ice Information telephone line, 401.667-6222. The Mass Wildlife field office in Westborough, MA suggested contacting local police departments for safe ice conditions in your area. Last year our oceans were the warmest ever. In fact, the past five years are the warmest years on record. This warm water has caused a shift in fish populations. We know black sea bass, scup and summer flounder are more abundant in the north and we now often fish these species. But what about fish like king mackerel and triggerfish that are now consistently caught in New England? Learn how to fish these species and others at a Rhode Island Saltwater Anglers Association (RISAA) ‘New species’ seminar Monday, January 28, 7:00 p.m., West Warwick Elks Lodge, 60 Clyde Street, West Warwick. Noted On-The-Water magazine author and fishermen Jimmy Fee will be the guest speaker. Dinner served by the Elks Lodge starting at 5:30 p.m. Visit www.risaa.org for details. The Narragansett Chapter of Trout Unlimited (TU225) will host a monthly meeting and its first annual Chili Cook-Off on Wednesday, January 30, 6:30 p.m. at the Coventry / West Greenwich Elks Lodge, 42 Nooseneck Hill Road (Rte. 3, Exit 6 off of Rte. 95), West Greenwich, R.I. In addition to regular business, educational event planning and networking, members will assemble the line boxes that were constructed by members in the fall of 2018. Additionally, members are invited to bring a pot of their favorite chili recipe for tasting and judging by members and guests. The “2019 Anglers Choice” award will be given to the winner. For additional information, to reserve a seat for the line box assembly, or prepare a pot of chili for our distinguished member/guest judges, please contact chapter president Glenn Place 1-401-225-7712 or TU225President@gmail.com. Cod fishing. The Frances Fleet reports it has not sailed most of the week due to high winds and rough seas. However, as weather clears they will be fishing. Party boats (inspected vessels that take more than six anglers, often 50 to 75 anglers) out of Rhode Island fishing for cod this winter include: the Seven B’s at www.sevenbs.com, the Frances Fleet at www.francesfleet.com and Island Current III at www.islandcurrent.com. Rates per angler for cod fishing are about $100. Charter boats (six or fewer anglers) range from $750 to $1,200 per vessel depending if the cod trip is close to shore or offshore (and length of trip). Charter boats fishing for cod weather permitting are in flux this time of year. Check Big Game Sport Fishing Characters, Captains Brian and Peter Bacon, www.biggamefishingri.com; Booked Off Charters, Captains Tony Guarino and Wade Baker, www.bookedoffcharters.com; Drifter Charters, Capt. Richard Chatowsky, www.drifterchartersri.com. 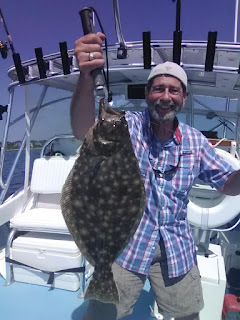 The Atlantic States Marine Fisheries Commission (Commission) manages migratory species such as summer flounder, tautog, scup and striped bass coast wide in state waters (zero to three miles offshore). The Mid-Atlantic Fishery Management Council (Council) manages many of the same species in federal waters, three to two-hundred miles offshore that we catch off Rhode Island and Massachusetts. Last month, the Commission and Council, approved three important measures and outlined them in a December 13, 2018 press release. The three measures aim to add to the suite of tools available for managing summer flounder, scup and black sea bass. First, the joint actions modified Fishery Management Plans (FMP) to allow the use of conservation equivalency for black sea bass (BSB) management. Conservation equivalency will allow recreational measures in federal water to be waived and instead require recreational anglers to abide by the measures of the state in which they land their catch. This will add continuity to regulations between state and federal waters with a joint annual decision to determine whether to enact conservation equivalency. Second, a joint action recommended that NOAA Fisheries implement a transit provision in Block Island Sound. The measure would allow non-federally permitted recreational and commercial vessels to transit Federal water while in possession of summer flounder, scup and black sea bass that was legally harvested from state waters. For example this measure would allow fish legally caught in state waters off Block Island to be transported across federal waters back into state waters off Pt. Judith and along the southern coastal shore of Rhode Island. Lastly, the use of slot limes, i.e. the use of maximum sizes in addition to minimum sizes, which was allowed by the Council is now allowed by the Commission too. Now both fish governing bodies can utilize slot limits for consistency if deemed appropriate. Prior to the joint meeting in December, the results of two summer flounder slot limit studies were presented via background memorandum to participants. The memorandum concluded, that with summer flounder overfishing now occurring and the summer flounder Spawning Stock Biomass (SSB) consistently below target levels for the past six years, slot limits would be harmful to the fishery at this time. The studies referred to in the memorandum included a 2009 ‘Slot limit management for recreational summer flounder harvest’ study by Wong (http://www.mafmc.org/s/Slot_limit_guidance_Wong_2009-002.pdf ); and a second study by Wiedenmann in 2013 titled ‘Evaluation of management and regulatory options for the summer flounder recreational fishery’ available at http://www.mafmc.org/s/A-Model-to-Evaluate-Recreational-Management-Measures.pdf . The memorandum said, “The 2009 study analyzed a range of slot limit options for the recreational summer flounder fishery and considered a range of bag limits and options for trophy fish in combination with slot limits. The results indicated that, compared to a standard minimum size limit (which we now have), the slot limit options considered would ‘certainly result in greatly increased numbers of fish harvested’ due to the higher availability of smaller fish compared to larger fish. The government shut down is upon us and it is starting to have an impact on the fish too. Last week I was scheduled to attend two Federal Government sponsored workshops and both were cancelled. The shutdown is having a profound effect on people in this county and needs to end as it demonstrates a total failure in government. The President and members of congress and the senate are elected to serve the people, the shutdown is serving no one so let’s open the government and put the issue of border security, immigration and the wall on the front burner to work out in a bipartisan fashion this year. Last week a meeting to review the Environmental Impact Statement on the first ‘utility scale’ offshore wind farm off Massachusetts being developed by Vineyard Wind was canceled in Rhode Island. The meeting was organized and being run by the Bureau of Ocean Energy Management (BOEM), a federal government agency. Commercial fishermen have voiced their concern about the layout of the wind farm and the inconsistent spacing between turbines in the windfarm. Additionally, recreational fishermen have expressed concerned about no rod and reel surveys being done to study the impact on recreational fishing , and the absence of aerial or acoustic studies to measure impacts on pelagic species such as Mahi, tuna, sharks as well as whales. The hope is that this important BOEM meeting and others are rescheduled and deadlines extended to insure proper public input and discussion. The second fisheries meeting canceled last week was the NOAA Fisheries sponsored New England Recreational Fishing Workshop which was scheduled to be held at the URI Coastal Institute Building in Narragansett on January 10. The purpose of the workshop was to facilitate a collaborative process for developing management measures for the recreational ground fish fishery that balance the need to prevent overfishing while providing for robust catches that enable profitability in the for-hire fleet and provide worthwhile fishing opportunities for anglers. The hope is that this meeting is rescheduled. As this week progressed, we heard other ways how the shutdown disrupted National Marine Fisheries Service (NMFS) quota monitoring and stock assessments in locations across the country (summer flounder, striped bass and black sea bass in our area), deprived Coast Guard members of paychecks, and is delaying the timely implementation of catch limits for scallops in waters off New England. Let’s hope the shutdown ends so we can move forward to fish and the scientist, fish managers and Coast Guard can get back to normal.